Is Your Child Suffering From Binocular Vision Dysfunction? Home > What Is BVD > Could it be my child’s eyes? Has your child been complaining of headaches or blurred vision that doesn’t seem to have any discernible cause? Does your child have poor depth perception, clumsiness, and difficulty with hand eye coordination? If so, there’s a strong chance he or she might have a visual disorder known as vertical heterophoria (VH), which is a commonly undiagnosed binocular vision dysfunction. 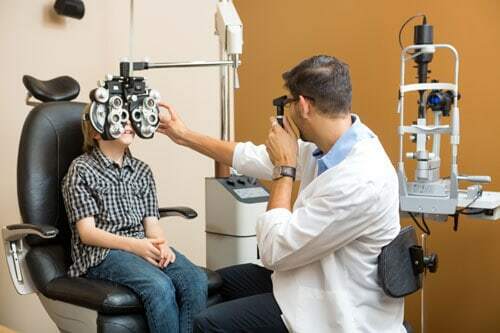 The experts at the Neuro Visual Center of New York are here to diagnose your child to determine if the problem is his or her eyes and develop a treatment strategy to help your child improve in school and sports. Binocular vision dysfunctions are the result of one eye seeing an image differently than the other eye. This can be vertically, horizontally, or both directions. The eyes attempt to correct this misalignment by straining and exerting the muscles in the eye, which leads to symptoms of BVD. A binocular vision dysfunction like vertical heterophoria, superior oblique palsy, or convergence insufficiency often presents itself in children as trouble with reading, concentrating and learning as well clumsiness, poor depth perception, headaches and dizziness. We understand how frustrating and disheartening it can be to watch your child suffer and not have a discernible answer or treatment. Let us give you and your child the relief you both deserve. The Neuro Visual Center of New York specializes in diagnosing and treating BVD with the use of custom prismatic eyeglasses. Narrow down the causes of your child’s discomfort. Call 516-224-4888 and schedule a Neurovisual examination with Dr. Israeloff. She’s just as well-versed in taking care of children as she is adults.